Put Vs Call Option in NCD? How to Apply for NCDs? How to Hold NCDs – Physical Form or Demat? Taxation and TDS on NCD? Non-convertible Debentures (NCDs) are similar to Fixed Deposits (FD) but they are issued by companies to raise funds from investors for their business. They are called Non-convertible as they cannot be converted to shares of the issuing company on a future time as in case of Convertible Debentures. They are also popularly known as Bonds or Debentures. Similar to FDs, the companies pay a fixed interest for the entire tenure of investment. This interest rate is known as coupon rate for NCDs. Based on whether the fund raised by the company is backed by asset or not, it’s classified as Secured vs. Unsecured NCD. As the name suggests, in case of Secured NCDs the funds raised by company is backed by its assets. In case of default by the company in payment of either principal or interest due, the asset can be liquidated and investors can recover their money. As the name Unsecured suggests the funds raised by company are not backed by any security. Based on payment frequency of interest on NCD, it can be classified as Cumulative Payout or Regular Payout. Companies regularly come out with NCD offers throughout the year. These NCDs are offered by financial institutions, banks, and brokers etc to retail investors. In case you have Demat Account, it’s easiest to apply through that. There is no paper work and everything can be done online. In case your Demat account is not offering the NCD, you can apply through filling up physical forms available with sellers of the NCDs. There you can mention your Demat Account Number and the NCDs would be allotted to your Demat Account. You can also buy and hold the NCDs in physical form. Many companies do not offer NCD in Physical forms. Even if they do not all investment options would be available for Physical allotment. For e.g. in case of recent Muthoot Finance NCD option 10 was not available for Physical Holding. Most of the NCDs are listed on at least one Stock exchange (NSE/BSE). But unfortunately for most of NCDs the liquidity is low on Exchange and hence it’s difficult to buy/sell at fair price. If you need to exit urgently, be prepared to sell at a discount. That’s why it’s recommended to invest in NCDs with view to hold it till maturity. For Tax Purpose NCDs are treated as Debt Investment (similar to FD). The interest earned is added to your income as “income from other sources” and taxed accordingly. In case the NCD is sold before maturity on stock exchanges, it would lead to Capital Gains and taxed according to the holding period. There is no TDS (Tax deduction at Source) deduction for NCD held in Demat form, while in case of NCD held in Physical Form, TDS would be deducted if the annual interest payout is more than Rs 5,000. NCDs are good investments and should have a place in your Debt Portfolio. If carefully chosen they offer higher returns than Bank Fixed Deposits. Never invest in companies/sectors that are going through bad phases or have shoddy business practices like Real Estate companies. The due diligence process is similar to equity investment. Do not buy NCDs of the company if would be not comfortable buying their shares. The price of NCD increases with fall in interest rates and vice-versa. Please share your thoughts in case I missed something or you have any questions! I want to buy ncd from the market then how they calculate interest and how i know its maturity? If i remain invested till maturity which is more than 12 months then the tax will be calculated as long term capital gain 20% with indexation benefit. My question is this long term capital gain is applicable even for maturity withdrawal or only for pre-withdrawal? Capital gains arise only when the NCD is sold on stock exchange. In case you hold it till maturity it’s interest income and taxed as per tax slabs applicable to you. Is the doubling bond (NCD) is taxable on maturity? 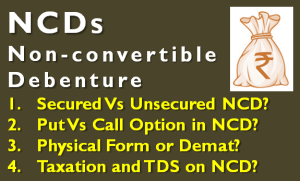 Is the exemption in TDS is available in NCD annuel interest with Form No.15 with 2.5lac limit?